The story begins in 1973, the same year which Campagnolo Super Record group was introduced. 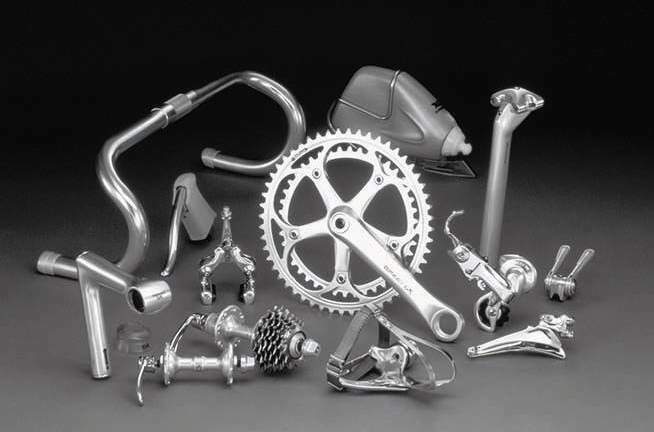 The first Dura-Ace was built using aluminum. 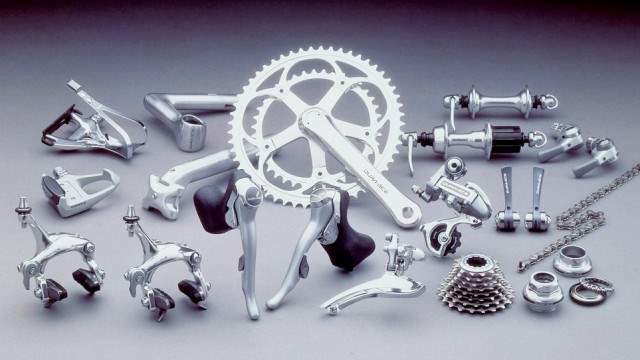 It was Shimano’s first attempt to the professional quality road racing component group niche which dominated by Campagnolo, the Italian manufacturer who was unchallenged for years. There were two types of rear derailleur (short-cage, up to 28-teeth compatible and the long-cage, up to 34-teeth compatible). The cranks were 39/52 165mm, 45/54 165mm, 39/52 170mm and 45/54 170mm. The “pro” model had 5/6 speed options, while “touring” model was 5-speed. It was a track groupset used a 10mm pitch chain and gears. Almost all bike chains are half-inch pitch, so the centers of the pins are half an inch, or 12.7mm, apart. 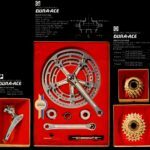 Introduced in 1976, and discontinued some time in the 80s, Dura-Ace 10 used a smaller chain and therefore smaller chainrings and sprockets – the number of teeth was the same, but they were closer together. The biggest advantage was lower weight, and eventually, according to legend, the Japanese Keirin federation banned the 10mm pitch equipment because it might give some riders an unfair advantage. 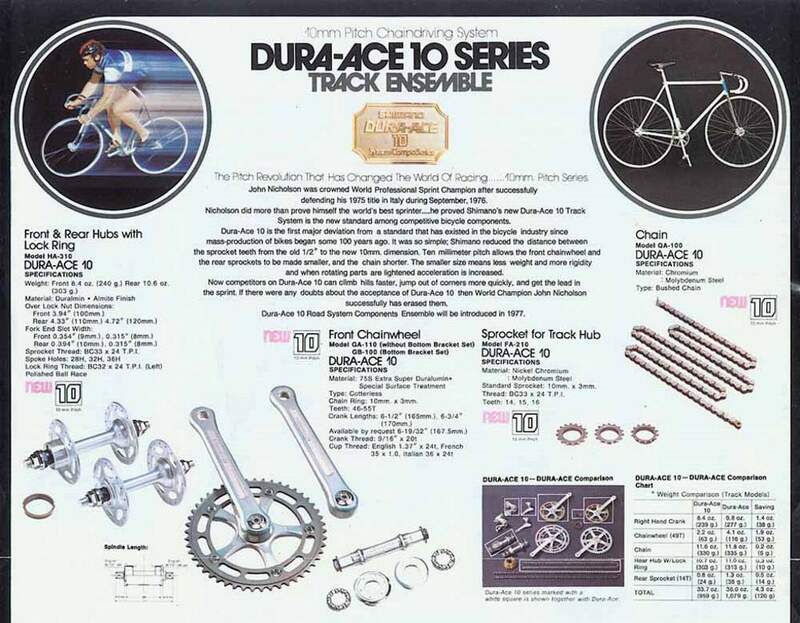 Shimano Dura-Ace 10 Series catalogue (1976). 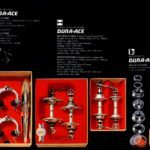 It was the second generation Dura-Ace. It was slightly different from the First Generation parts. Crank arms appear to be the same, but with different rings and used standard pedal threading. 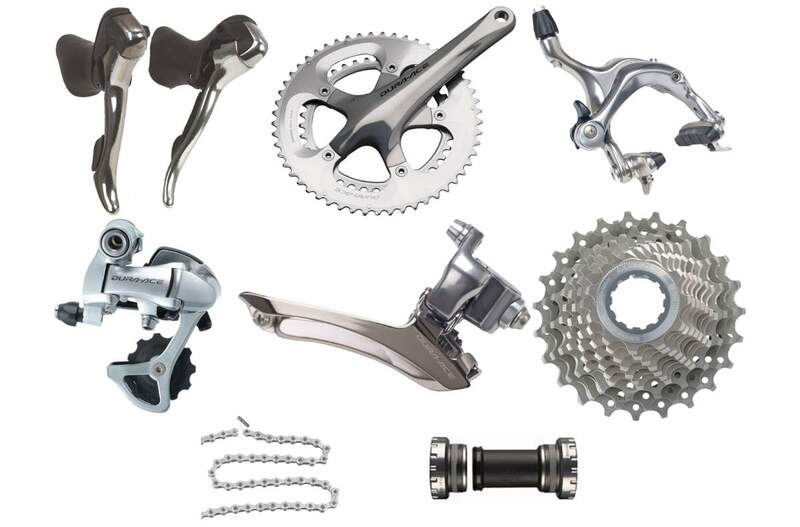 The Dura-Ace EX 7200 introduced Shimano’s EX concept as being a design optimized for the (then radical) idea of using 6-speed, particularly with the new freehubs. 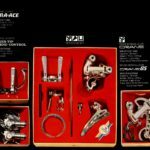 Shimano Dura-Ace AX 7300 comes out in 1980. It is specifically designed to be more aerodynamic. 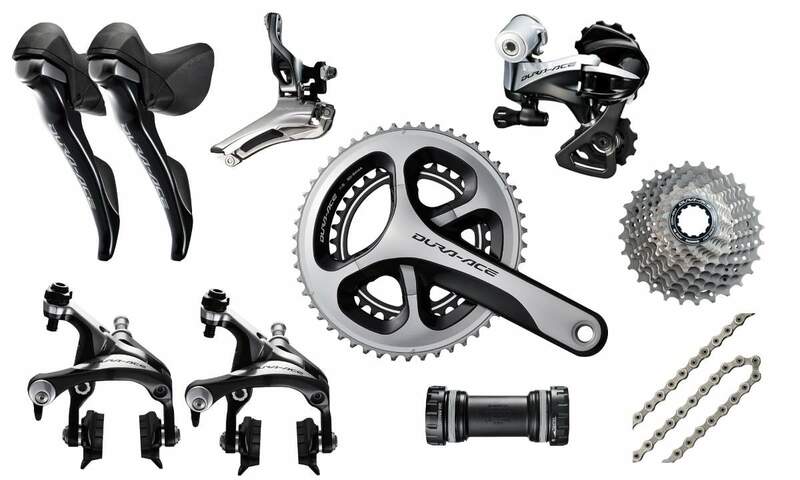 Despite being a commercial disaster (Dura-Ace series were not really successful until the introduction of the indexed shifting, the “Shimano Index System – SIS” in 1984), the AX 7300 is arguably one of the foundation stones of Shimano’s current success. It created a fear of being left behind that forced every other derailleur manufacturer in the world to redesign their own derailleurs to incorporate “aerodynamic” elements. 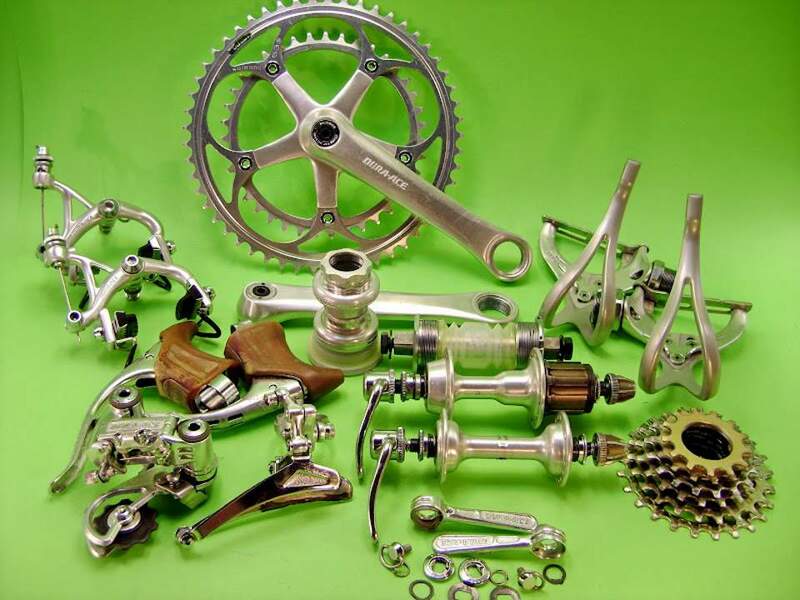 With the European manufacturers already on their knees, and SunTour about to be clobbered by technical problems, this expenditure crippled every one of Shimano’s competitors. Shimano Dura-Ace AX 7300 group (1980). 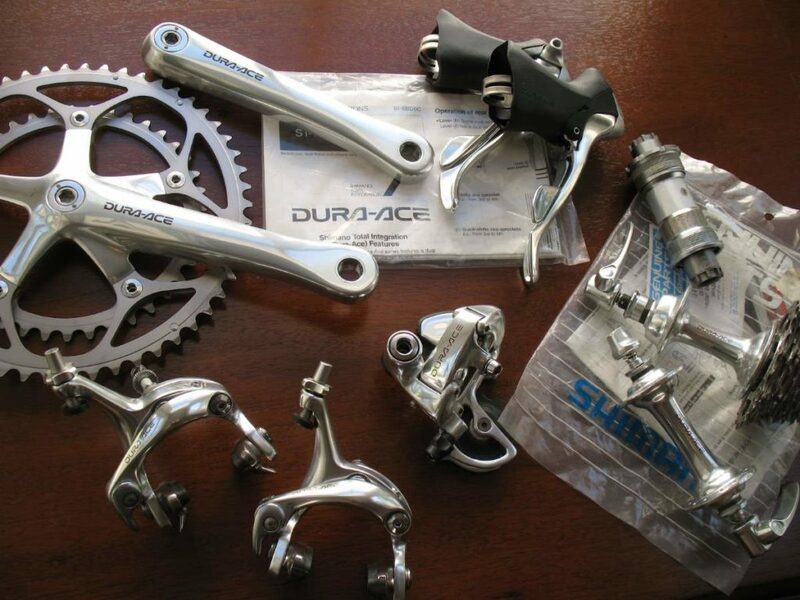 In 1984, Shimano introduced Dura-Ace S.I.S. 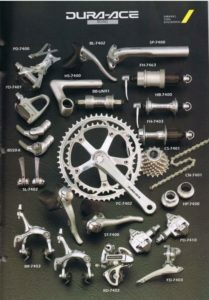 (Shimano Indexing System), the first successful indexed-shifting system in cycling history. It was a 6-speed (then 7 and 8-speed with the new versions) system with indexed shifters mounted on the down tube. 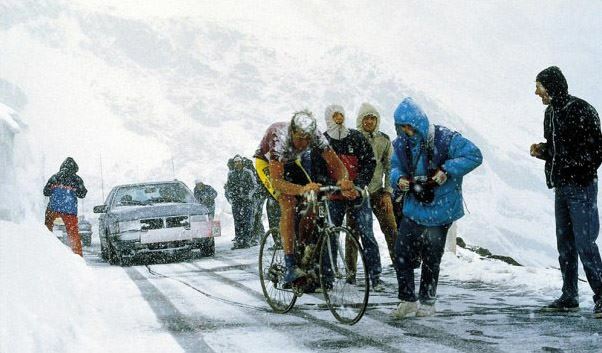 In 1988, Andy Hampsten (Seven-Eleven Team) won the Giro d’Italia with Dura-Ace groupset. 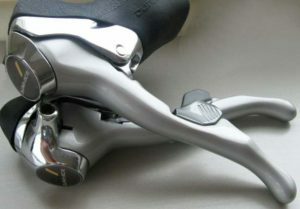 The dual-control lever incorporates a shifter mechanism into the brake lever, making it possible to change speeds without removing one’s hands from handlebars. 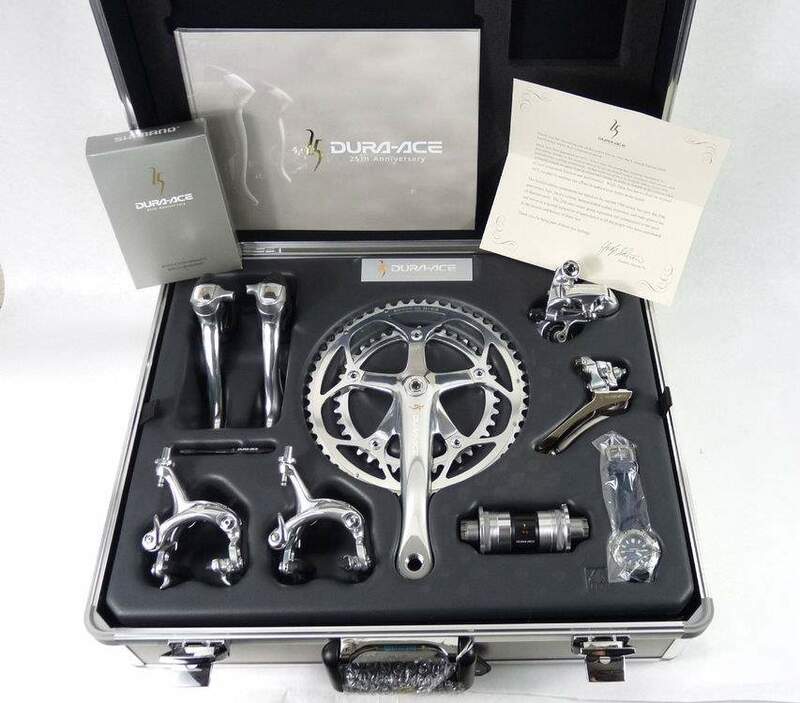 It was actually the last of the Dura-Ace 7400 series, but was enough of a departure from the original 7400 series that many sources list it as a separate group. 7700 series are developed after thorough review of the previous derailleur system based on the philosophy of “Stress-Free”. This series is a special Dura-Ace released in commemoration of 25 year since its introduction in to the market. Lance Armstrong of the US Postal Team won the Tour de France 1999 using Dura-Ace 7700 groupset, but the U.S. Anti-Doping Agency (USADA) stripped his all seven Tour de France titles in 2012. 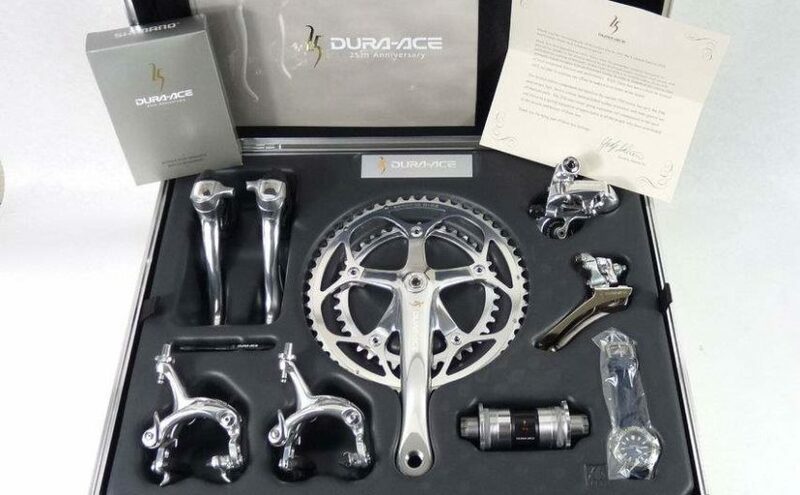 Dura-Ace 7800 series components are developed with “For 100% Power Transmission Efficiency” as a catchword. This series consisted of 10-speed rear drive trains, HOLLOWTECH Ⅱ cranksets, ergonomic dual control levers, and other higher performance components. It was the first 10-speed group of the market. Alberto Contador, the Spanish rider of Discovery Channel team won the 2007 Tour de France using Dura-Ace 7800 groupset. Now Shimano has total of 7 Tour de France victories (as of 2016). The 7900 series components were developed under the concept of “Evolution of Perfection”. A derailleur comprising these components embedded the shift cable completely. 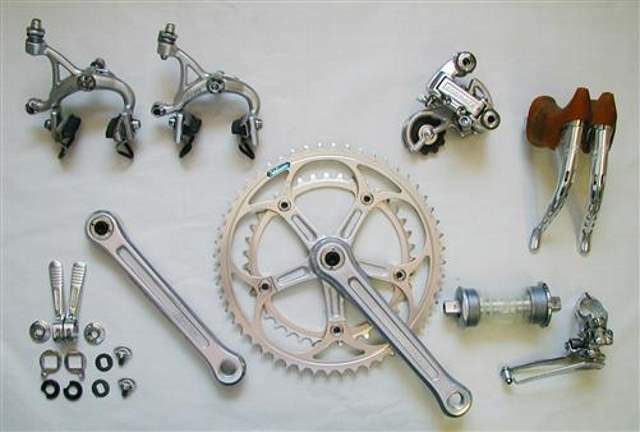 Its crankset consisted of a HOLLOWGRIDE (hollow gear) in addition to a HOLLOWTECH Ⅱ. All other components were also reviewed for optimal design. 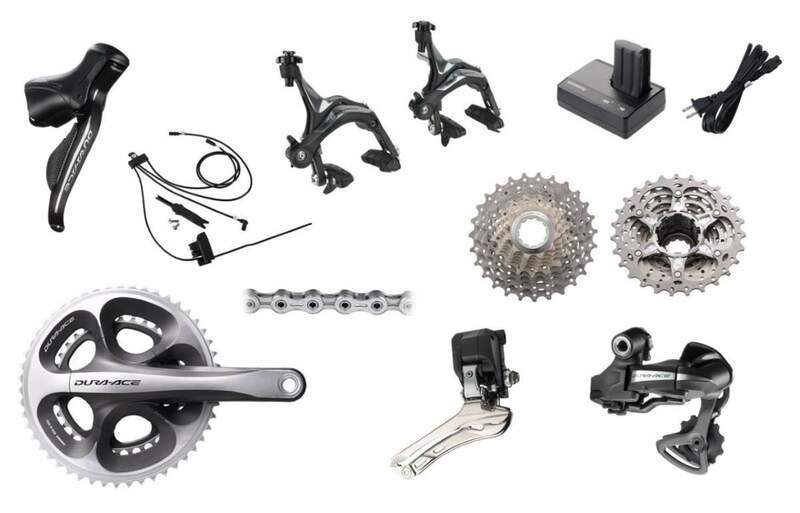 The weight of the groupset w/out hubs reduced from 2181 grams (DA 7800) to 2052 grams (DA 7900). 2009 Electronic Shifting System DURA-ACE 7970 is in the market. 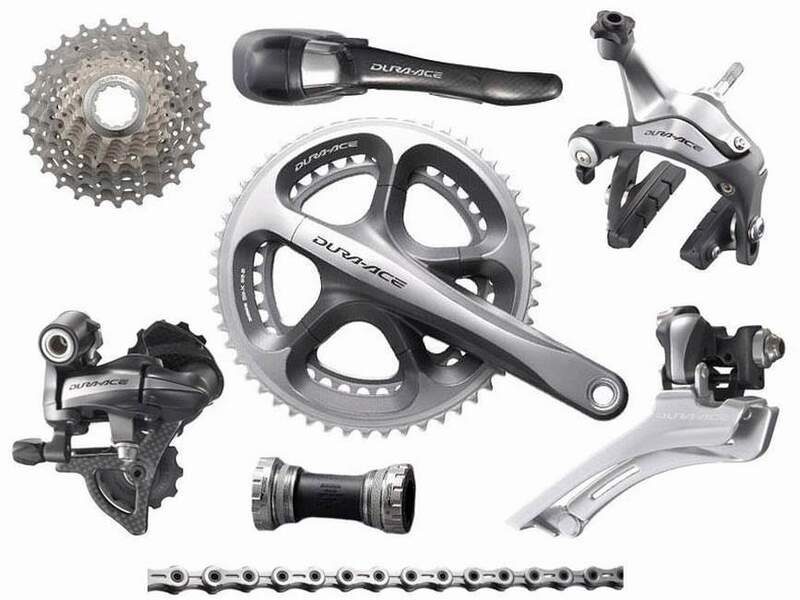 A new technology called “Digital Integrated Intelligence (or Di2 for short) was introduced into Dura-Ace. The Dura-Ace 7900 series equipped with this electronic shifting system provide racers with a “complete stress-free” function. Enhanced shifting performance is the most obvious benefit of Shimano’s Di2. “A solution to a problem that doesn’t exist.” “Unnecessary.” “A marketing gimmick.” Those were lines offered against Shimano’s Dura-Ace Di2 electronic drivetrain, but it quickly became a racing standard. Today, almost every pro team use electronic gears. The new series have been fully re-engineered across every system. Highlights include a robust four-arm cranksets, the new SLR-EV brake system and a new 11-speed drive train. 9000 is mechanical and 9070 is electronic (Di2) series. 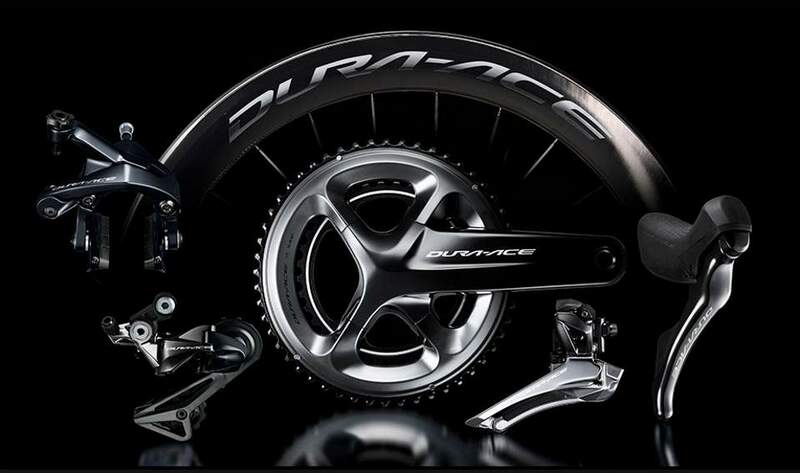 Dura-Ace R9100 (mechanical) and R9150 (electronic) series coming with an integrated power meter (which has been ten years in development), first-ever Dura-Ace hydraulic disc brakes, and the option of synchronized front and rear derailleur shifting to minimize cross-gearing. The crankset and the front and rear derailleurs were also redesigned. Another change point is the largest sprocket size: it was 28-tooth on previous versions of Dura-Ace, but now version is offering an 11-30-tooth cassette. Shimano use codes R9100 and R9150 for the groups with classic rim brakes, and R9120 and R9170 for the groups with hydrolic disk brakes. See more at Shimano’s website.